Samsung and Xiaomi are two of the biggest forces in the mobile world, though the latter is not nearly as popular in the West (for the time being, at least) as its South Korean rival. That said, Xiaomi has a hefty portfolio of impressive phones, both mid-range and flagships alike, and the latest high-end device from the company is the Xiaomi Mi 9 – a sleek and powerful handset that aims to compete with the best of the best, and at a lower price. 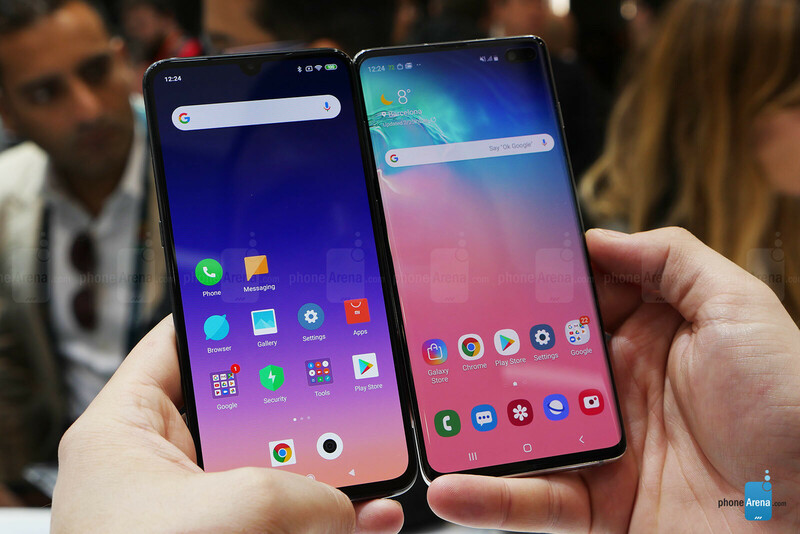 But how does the Xiaomi Mi 9 compare to one of the hottest, most highly-anticipated phones of the year, the Samsung Galaxy S10+? We’ve had the chance to spend some quality hands-on time with both devices and already have some impressions about how they feel and handle day-to-day tasks. So, without further ado, here's our initial impressions of the Xiaomi Mi 9 and the Samsung Galaxy S10+! A cursory glance at these two phones is enough to see that they take pride in the way they are designed. Both feature tall screens surrounded by very thin, unobtrusive bezels. The biggest difference up front is in the notch, or lack thereof on one of the devices. The Xiaomi Mi 9 has a small, waterdrop-style notch centered on its top bezel, while the Galaxy S10+ does away with the notch and employs a "punch-hole" front-facing camera instead. It still takes away a portion of the screen, but it's arguably a better solution that the standard, wide notch that we've seen on many a phone over the last year. Better yet, its size is at least justified by the fact that it houses two selfie shooters! That said, is it a better solution than Mi 9's waterdrop notch? Well, that's up for debate. 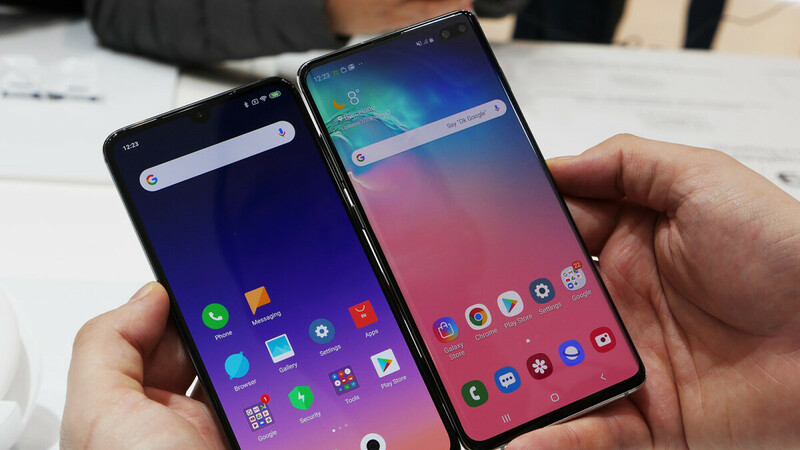 What we can tell you right now, is that both solutions are largely unobtrusive, especially when compared to the typical notch design. Xiaomi's solution, however, is about half as big as the punch hole on the S10+. On the other hand, Samsung's curved Infinity display really does a great job at blending the side bezels with the phone's frame, creating a sleek, seamless look. Around the back, both the Xiaomi Mi 9 and Galaxy S10+ are all-glass and feature triple camera setups. However, the Galaxy has a horizontally-oriented camera module, while the Mi 9 bets on a vertical implementation. Holding the phones, both come feel great due to their premium build quality and slim profile. 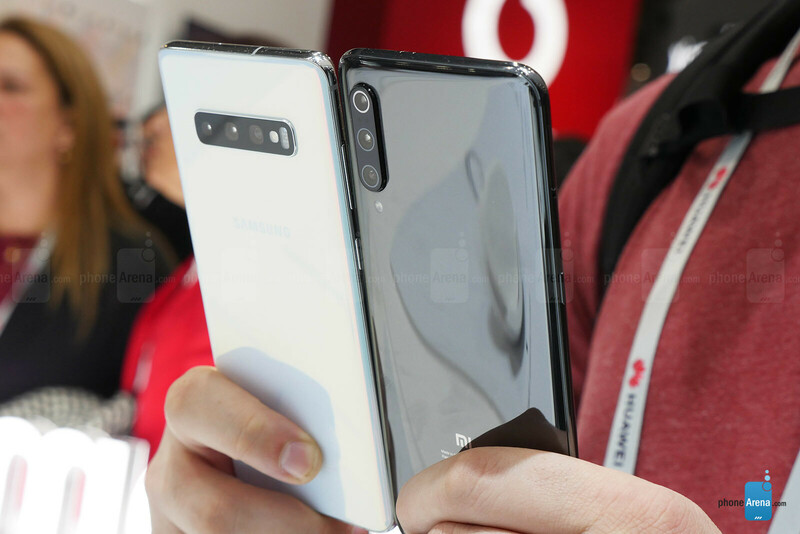 All in all, both the Galaxy S10+ and the Xiaomi Mi 9 look great, so if were concerned with the design of these handsets, it's all going to boil down to personal preference. Both the Xiaomi Mi 9 and the Galaxy S10+ have 6.4-inch OLED displays, though the Galaxy S10+ has a higher-resolution panel. Both are enough pixel-dense, though, and produce a nice picture. The Galaxy may have an edge in terms of brightness and overall color quality, as Samsung is at the top of the game with its AMOLED displays. On the power side of things, both phones are running on the latest and greatest Snapdragon 855 chipset, backed by 8GB of RAM. Suffice to say, neither is a slouch. Where the Mi 9 lags behind, though, is in the battery department. The Galaxy S10+ features a 4,100 mAh battery, while the Mi 9 is powered by a much more modest 3,300 mAh cell. Tune in for our battery tests when we get the two phones at the office. As far as cameras go, both phones feature triple camera setups that combine a regular, ultra-wide angle, and telephoto lenses for maximum flexibility. Xiaomi has been improving the quality of its cameras over the past year, so you can expect some pretty impressive results from the Mi 9. Samsung is an expert at delivering great photography experiences on smartphones, so we have high hopes for the Galaxy S10+ and its three main cameras. We are going to be testing both at length in the coming weeks. The Xiaomi Mi 9 and the Galaxy S10+ both run custom Android skins. 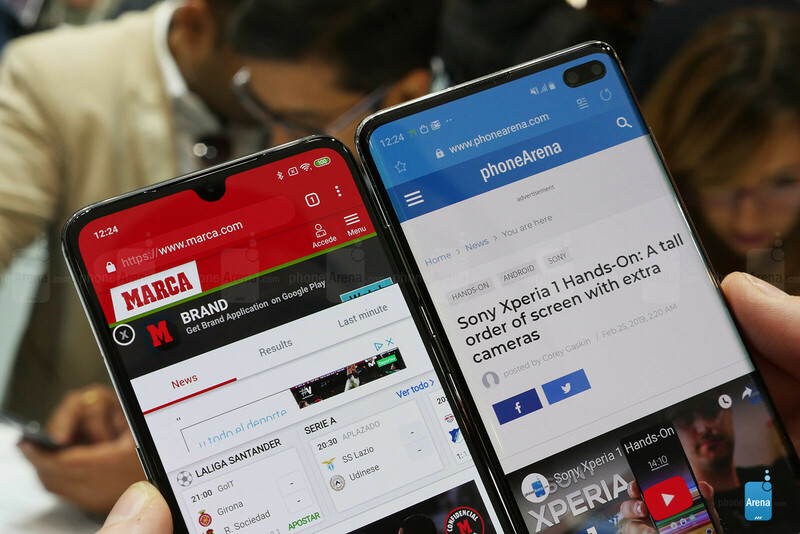 The Mi 9 is running the latest version of Xiaomi's MIUI, while the Galaxy S10 showcases Samsung's radically overhauled One UI, both based on Android 9.0 Pie. MIUI 10 offers a colorful and snappy interface that has a great gesture-based navigation mode. Xiaomi's gesture solution is head and shoulders above many others, featuring intuitive actions mapped to the bottom and side bezels of the phone. All UI elements respond nicely to the swipes and we are particularly fond of the "Back" gesture, which is extremely easy to execute with either hand and from either bezel. It truly takes one-handed use to heart and tries to streamline everything in a meaningful way. Samsung's One UI has been a long time coming. The new UI is an effort to completely erase any cartoonish trace left of TouchWiz. It is abundant in solid colors, rounded shapes, and though the iconography may not be as sleek as we'd hoped, One UI looks, feels, and responds great. Samsung also has a gesture-based navigation system to call its own, though it is arguably less intuitive than Xiaomi's. Still, we are expecting good things to come out of it, as development on it progresses. It took them some time but finally xiaomi is able to produce a flagship that looks better than Samsung's. Mi 9 is the best Android flagship phone to buy. I love the mi 9 and at a first glance it looks as good as the s10+ but when you take a closer look.... smaller battery, lesser build quality, lesser screen, lesser resolution, no ip68 rating, no dept camera, miui not as streamlined as samsung one ui. Yes Xiaomi price is crazyyyyy and its an awesome phone but the differences are there. And after having ok phones for the past year, I really am looking forward to having a "one of the best" phone. Cant be bothered running into small annoyances. Dual front cameras on S10+ are ugly. It doesn't make sense to put an extra depth sensing camera on the front . S10 all the way. Not S10+, just S10. It would be the Mi 9 for me except for the 3300 mAh battery. Needs to be at least 3500 mAh. I'm looking forward to seeing if the SD 855 improves battery life over the SD 845. The 845 was a step back in battery life over the SD 835. Cmon PA, get your facts right. S10+ has a 10Mp selfie cam + an 8Mp depth sensor setup on the front... Anyway, about the phones mentioned above, Mi9 is a great phone, no question about it, but is in no way in the same league as the s10/s10+ except for performance... Everything else, no matter how subtle the diference may be, is a class or two below. Thats's the harsh truth. But hey, at least Xiaomi is compensating in price, so kudos to them for doing that.